I started "officially"looking for baby things (online) today. My sister has been making fun of me because I am so clueless about what I need to get. 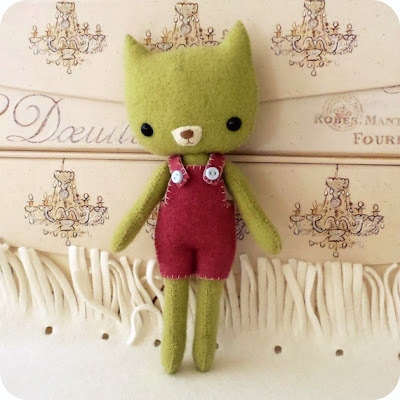 Anyhow, I found this sweet little kitten from Ginger Melon and fell in love with it. It is the very last thing that baby needs but isn't it so cute? I'm sort of loving that I can look at things that normally I would pass up. There is just so much cuteness out there. That is too cute! As far as baby stuff, it can be overwhelming...I felt like I had entered into a whole new realm of weirdness when I found I was spending HOURS researching cribs, strollers, etc. Crazy. As far as baby things, I've found that babies actually need very little past lots of love, holding and cuddling, and mama's milk. I have found a pouch sling and a bouncy chair to be indispensable though. What an exciting time! Oh, I do love that kitty. I want to know where you end up looking and finding things ... so keep us posted! I wouldn't have resisted it either! =) Cute!